Imperial Japanese Navy battleship and lead ship of her class – the heaviest and most powerfully armed battleships ever built. 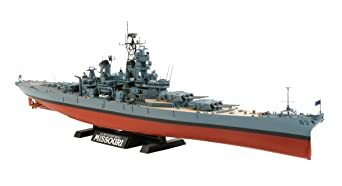 Kit features optional full or waterline hull with internal reinforcing structure and screws, pivoting rudders, excellent fine raised and engraved surface textures, fully detailed superstructure and weapons, 18″ gun turrets with interior detail (including gun breeches) and barbette detail, interchangeable blast bags allow mains guns to be positioned at high or standard elevation, durable ABS mast components, optional position hangar doors, ship’s boats, FM1 and E13A seaplanes, anchor chain, fine deck fittings (90 of the deck components are molded separately), metal propeller shafts, photo-etch parts (nameplate, cable reels, crane booms, aircraft details, catapult rails, small platforms, ladders, radar) plus display stand. Completed model is approximately 29.6″ long. Also includes color painting guide, printed paper flag sheet and decals for hull markings and aircraft insignia. 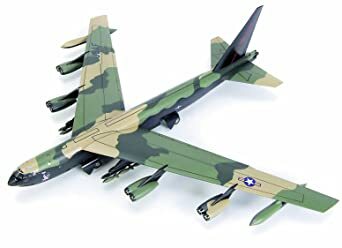 Long-range, subsonic, 8-jet, strategic bomber and enduring symbol of the Cold War; dedicated heavy bomber variant used extensively over Vietnam. Kit has fine raised panel lines and engraved detail, basic cockpit and tail gunner’s seat, quad tail gun fairing, detailed landing gear, internal bomb bay with bombs, wing tanks, pylons with external bomb load, plus optional position features (flaps, undercarriage and bomb bay doors). Decals and painting reference for 3 US Air Force aircraft: s/n 56-0675 ‘Pink Panther’ of the 92nd Bomb Squadron, 92nd Strategic Aerospace Wing, 15th Air Force; s/n 56-0604 ‘East to Westover’ of the 364th Bombardment Squadron, 99th Heavy Bombardment Wing, 2nd Air Force and s/n 56-0611 of the Strategic Air Command – includes stencils and instrument panel markings. In any review or history of the Royal Navy, the story of one ship stands out as one deserving special mention. This vessel is the HMS Prince of Wales, the second member of the famous King George V Class of battleships from the Second World War era. She was involved in several actions during the Second World War, including the battle of the Denmark Strait, where the Bismarck sunk HMS Hood. 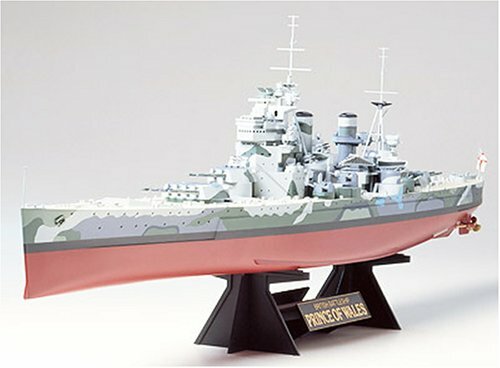 Prince of Wales was commissioned in January of 1941 and was sunk by Japanese aircraft on December 10, 1941. 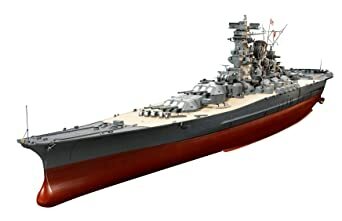 With many revolutionary features incorporated into her design, the Yamato was completed in December 1941, and met her final fate at the hands of American Navy carrier aircraft in the South China Sea while on a one way mission to Okinawa. This model features minor modifications to Tamiya’s previous Yamato replicas Items 78002 and 78014, and has her looking as she did just prior to departing for her final mission, in an exquisite 1/350 scale assembly kit display model. 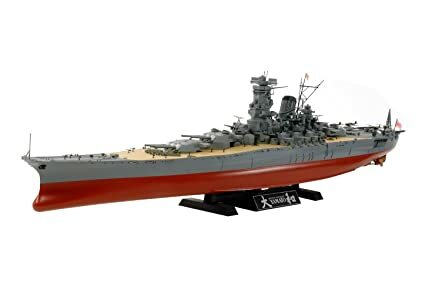 The Yamato’s massive imposing silhouette is accurately reproduced, and both the main gun turrets and secondary armament turrets can be rotated even after assembly. 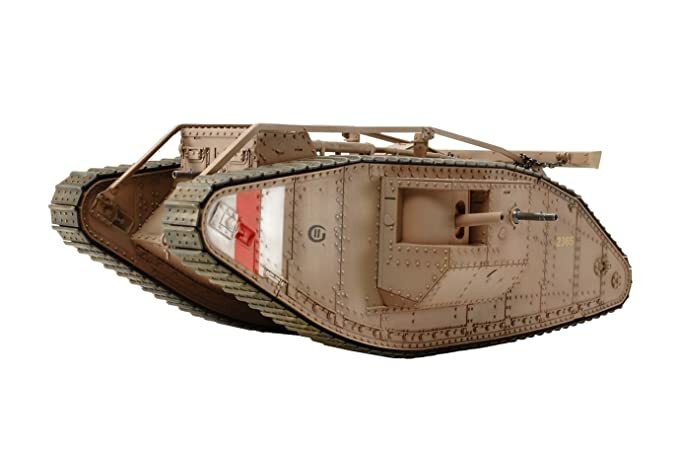 The Mark IV was a British tank of the World War I, introduced in 1917, it benefited from significant developments on the first British tank, the intervening designs being small batches used for training. Kit features highly detailed exterior with rivets, individual track link (movable), power is supplied from the gearbox via multiple gears to the durable metal rear sprockets, (pre-assembled motor and gearbox unit), metal chain, cable, 6-pounder gun, 7.62mm Lewis gun, separately molded drivers and commanders hatch. Includes WWI British Infantry (officer, infantrymen and machine gunner) with separately molded weapons and equipment. On-off switch under bottom hull. Requires (1) R6/AA/UM3 battery ‘Not Included’! Decals and markings for 3 British vehicles: (x2) (H45 Hyacinth, H Battalion, near Rib court) and (B28 Black Arrow II, B Battalion, Fontaine-Notre-Dame) France, November 1917 and (x1) Glam organ, G Battalion Location Unknown 1918. US Navy Iowa class battleship as modernized in 1982 missile-carrying fit. Updated kit has new tool features (12.7cm DP guns, Mk.37 gun directors, Mk.38 direction finder, Mk.48 rangefinder, Mk.13 radar, Mk.25 radar), single-piece full hull, detailed deck surfaces (with engraved plank texture as applicable), fully rendered superstructure, fine deck fittings, updated weapons suite (including harpoon and Tomahawk missile launchers, Phalanx CIWS, SRBOC rocket launchers), filigree mast lattice, SH-60B helicopters (choice of extended or stowed rotors), ship’s boats, 16″ projectiles (x2), Tomahawk missiles (x2), display stand with nameplates, metal propeller shafts, stainless steel wire (to rig Dicone-Cage antennae), photo-etch detail parts (including helicopter deck fences, water tight doors and new form SPS67 radar, SPS49 radar, SRA57 antenna, SRA58 antenna) and reference booklet (ship’s historical background). Completed model is approximately 30.5″ long. Includes printed paper flag sheet, starboard color profile and decals for hull markings, helipad and upper works. 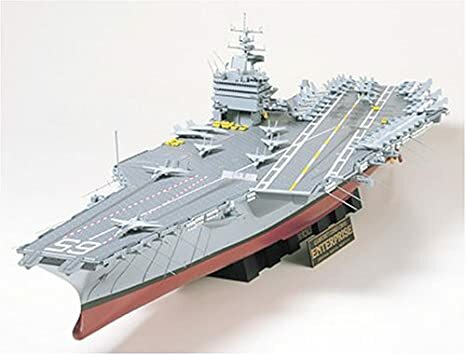 Large deck includes landing signal lights, angled deck center line, landing area runway marking and many more features. Side and ammunition elevators. Nylon line for elevator purposes, Unassembled mobile crane, Antenna wire to make model more realistic, Attaching cutters. Several different airplanes and jets, Detailed pictorial instructions, which include an in-depth history of the battleship. 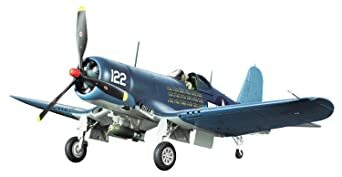 This is a highly detailed model recreating the F4U-1A variant of the highly popular Corsair model. Newly-designed parts are included in the kit to accurately capture the modifications which distinguish it From the original F4U-1. The F4U-1A drew on the experience of Navy and US Marine Corps pilots’ experience with the original aircraft, making modifications to further improve the performance of this legendary bird. Kit features more than 450 parts in grey plastic (plus 11 for the two figures); 49 parts in clear (includes 22 limited edition clear cowl parts); four black plastic pieces; two frets of photo-etch; one self-adhesive metallic name plate; a self-adhesive masking sheet; two vinyl tires; two metal rods; one screw; one nut; one small screwdriver; one poly cap; two decal sheets with markings for three schemes. The US Navy’s 3rd Iowa class battleship as refit for Gulf War service in 1991. Updated kit has new tool features (including bridge area, Tomahawk launcher deck, aft bridge deck, funnel, aft funnel mast, radar dome, No.1 turret ventilator, Mk.37 gun director, deck ventilator and RQ-2 Pioneer), single-piece full hull, detailed deck surfaces (with engraved plank texture as applicable), fully rendered superstructure, fine deck fittings, updated weapons suite (including Harpoon and Tomahawk missile launchers, Phalanx CIWS, SRBOC rocket launchers), filigree mast lattice, SH-60B helicopters (choice of extended or stowed rotors), ship’s boats, display stand with nameplates, metal propeller shafts, stainless steel wire (to rig Dicone-Cage antennae), photo-etch parts (including helicopter deck fences, water tight doors, SPS10 radar, SPS49 radar) and reference booklet (ship’s historical background). Completed model is approximately 30.5″ long. T 06.00 hours on Saturday 24th May 1941, the Royal Navy was dealt one of its most shattering blows. The 42,000 ton battle-cruiser Hood was destroyed after an action lasting barely eight minutes with Bismarch, the largest and most modern battleship in service with the German Navy. Three days later, after the most celebrated sea chase of the Second World War, which involved no fewer than three British battleships, two battle cruisers, two aircraft carriers and nine cruisers, plus numerous destroyers, Bismarck was brought to bay, reduced to a blazing hulk and finally sunk. The career of the most feared German warship was terminated a mere nine months after she was commissioned. 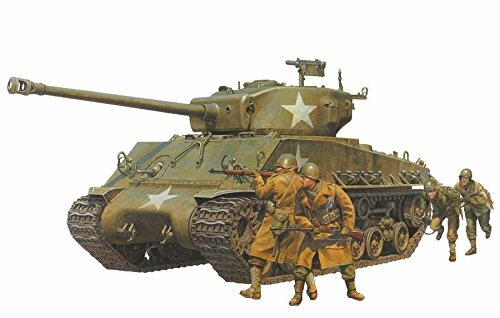 The M4 Sherman, officially the Medium Tank, M4, was the primary battle tank used by the United States and the other Western Allies in World War II and proved to be a reliable and highly mobile workhorse, despite being outmatched by heavier German tanks late in the war. Kit features detailed exterior, multi-piece lower hull, separately molded turret and hatches, 76mm gun, M2 heavy machine gun, detailed running gear (rollers, idler wheels, individual track links, moving HVSS suspension), transparent parts, photo-etched parts, optional muzzle brake, rear rack can be deployed or stowed, jerry cans and separately molded on-vehicle equipment. Also includes (4) figures (3 Riflemen and 1 Machine gunner, with separately molded weapons and equipment). Decals and markings for (5) vehicles: 5th Armored Division, Germany April 1945; 66th Tank battalion, 2nd Armored Division, Teuven, Belgium February 1945; 35th Tank Battalion, 4th Armored Division, Bastogne, Belgium February 1945; 8th Armored Division, Kirchhellen, Germany March 1945 and 8th Armored Div.